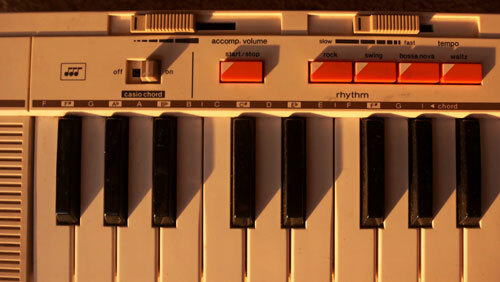 Casio claimed it could fit the sounds of dozens of musical instruments into its keyboards. Maybe it wasn't totally true, but the Casiotone gave us a lot. — Robert Larsen, the national sales manager of Casio’s electronic musical instrument division, telling the New York Times that electronic synthesizers were where it’s at. He had good reason to be bullish. In 1983 estimates from the American Music Conference, keyboards like Casio’s, which sold for around $200 a piece, represented $150 million in sales that year, compared to $93 million for all fretted instruments. Not bad, considering electronic keyboards weren’t even a $10 million business in 1980. Guitars are still with us, however. In 1979, a calculator came out that seemed to serve multiple masters. It was highly functional, but it served as something of a bridge between Casio’s earliest success stories and the devices that would define the company in the 1980s. This device, the Casio Melody-80, could do math, clearly, as it was a calculator, but it was also able to work as a stopwatch or an alarm clock. But the real trick, the one that makes it such an impressive artifact of 1979, is that it was able to work as a musical instrument as well—a device that had pre-programmed classical music that could be easily played, as well as the ability to work as something of a synthesizer. People didn’t need Beethoven with their math—certainly not when it sounded like this, and certainly not from The Sharper Image—but the device was a page-turner for Casio and the company’s primary designer, Toshio Kashio. Kashio was the second-oldest of the Japanese brothers who founded Casio and the man who played a key role in inventing many of the company’s earliest products. In 1978, Toshio led the company into the electronic music market, with an array of devices that would come to set the stage for the music industry in big ways and small. In order to obtain an artificial musical sound wave fairly analogous to its original natural musical sound, not only an analogous musical sound is used but also a volume envelope including factors such as wave rises and wave falls must be superposed on the analogous musical sound. However, there have been no proposals to effectively superpose the volume envelope on the sound wave by the digital technology. The conventional superposition of the volume envelope has been made by the analog technology or by using a complex control circuit. Thus, the musical sound wave formation technique by the digital technology, which is well adapted for [large scale integrated circuit] fabrication, has not yet been established in this field. The technology that Casio came up with for some of its earliest keyboards became known as vowel-consonant synthesis, for the similarities the company’s approach had to human speech. Beyond the Melody-80, Casio came out with a few more synthesizers that could be considered toys, like the Casio VL-Tone, famed for its central place in Trio’s “Da Da Da.” But in 1980, the company released its wood-encased Casiotone 201, the first musical instrument built around sound banks—a big step forward for the company, and for music in general. It could play an electric guitar, a banjo, a harpsichord, a trumpet, and even a glockenspiel. Unfortunately for Casio, these melodies almost never lived up to their billing—sounding more like distant cousins of a specific sound than an actual tone. But that proved incredibly valuable for actual professional musicians, who saw the melodies for what they were—a new palette to paint with. — Lloyd "Prince Jammy" James, offering his take on the creation of Wayne Smith’s “Under Mi Sleng Teng,” a song that turned reggae into dancehall overnight, all with the help of the Casiotone MT40, which had a preset that proved well-suited to a complete reinvention of reggae music. ( Here’s a clip of Smith’s co-conspirator, Noel Davey, playing the basic melody of the Sleng Teng.) As Engadget reported last year, the Casiotone melody has found itself in a number of unusual places since then. Casio’s decision to put its energy into sound-bank style keyboards proved fruitful—not only did it make the company a lot of money, but it also gave them a great sales pitch. Here was a device that could let you be your own band. Nearly as good is this clip featuring the Casiotone MT-205 with its optional drum kit attachment. Clearly, the intended audience for these things was the same audience that was waiting for that awesome A-Ha video to come on again. Eventually, Casio moved away from the Casiotone series, and tried a variety of different approaches. Casio saw the success Yamaha was having in the professional market and decided that it wanted in—initially having success with the CZ series (likely thanks in no small part to this amazing commercial), but failing to maintain that momentum. Casio eventually started making keyboards for kids that were even simpler than the Casiotones. 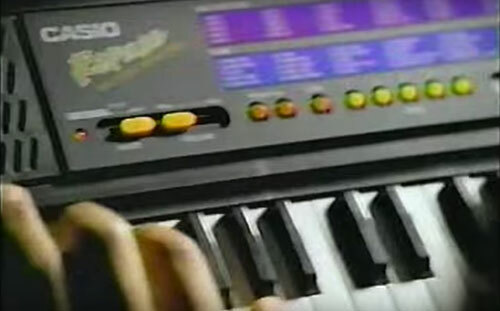 But eventually, Casio found another hit in the form of the Rapman, which won plaudits from professional reviewers for being fun to use compared to other keyboards of the day, despite the disastrous commercials. “Listen up: Casio's new Rapman does just about everything a bona fide rap group does,” The New York Times’ Dulcie Leimbach wrote back in 1992, clearly having never heard a bona fide rap group. But these kinds of tools—toys, really—hold a sort of intrinsic value culturally, the kind that led Toshio Kashio to this idea in the first place. A lot of creativity was had from that initial spark. 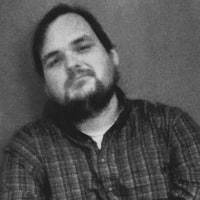 In mid-2007, I saw a YouTube video that floored me in its absurdity. On the scale of before-they-were-famous appearances, it’s miles above “active Vine user” and closer in its unexpectedness to The Party at Kitty and Stud's. Now, Dan Deacon is certainly no Sylvester Stallone on the fame scale, but he certainly was a bit of a fish out of water on the day that Savannah, Georgia’s WSAV decided to let him perform a live song, “Ohio,” on the air during the network’s morning show. There were probably a lot of wide-awake people in Savannah that morning. Sitting on Deacon’s table, surrounded by wave generators and a pile of cables, is perhaps the most powerful Casiotone ever made. The MT-400V, with its numerous effects, including an analog resonance filter, noise generator, and stereo chorus effects, somehow managed to find itself on the table of a serious (if absurdist) musical composer. Deacon wasn’t alone in finding love for these devices, despite their clear deficiencies compared to better pieces of professional gear. Artists way bigger (or, more often, smaller) than Deacon have embraced the Casiotone in ways big and small—whether as an element of a larger composition, or (in the case of the lamented Casiotone for the Painfully Alone) pretty much the whole act. See this viral clip of Jimmy Fallon, Metallica, and The Roots playing "Enter Sandman" on classroom instruments from just this week? They're keeping time with the help of a Casio VL-Tone. Circuit benders have broken these devices in ways that push them far past their limits. They’re artifacts, yet they’re still vital. In 2013, artist Daniel Arsham teamed with Pharrell Williams, who got his start on a Casiotone MT-500. Arsham took the shape of the keyboard and created replicas that were designed to look like they had suffered damage, like an artifact. Finally, someone captured a visual representation of the sound of these things.